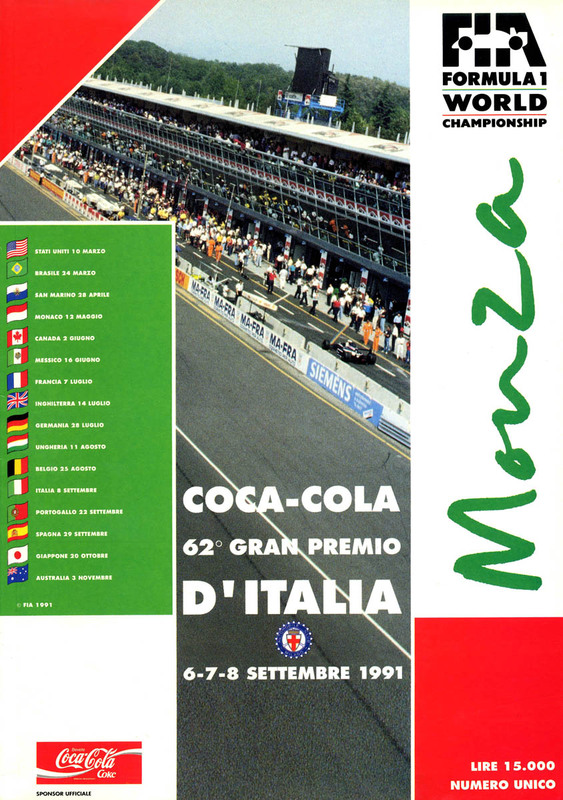 The 1991 Italian Grand Prix (formally the Coca-Cola 62o Gran Premio d'Italia) was a Formula One motor race held at Monza on 8 September 1991. It was the twelfth race of the 1991 FIA Formula One World Championship. The 53-lap race was won by Nigel Mansell, driving a Williams-Renault, after he started from second position. Ayrton Senna finished second in a McLaren-Honda, having started from pole position, with Alain Prost third in a Ferrari. The big news between the Belgian and Italian Grands Prix revolved around young Michael Schumacher, who had made his debut for Jordan in Belgium. Schumacher had signed for Benetton while still being under contract to Jordan. After much legal wrangling the German was confirmed at Benetton, while Roberto Moreno went the other way, taking Schumacher's place at Jordan. Elsewhere Michael Bartels was back at Lotus, as Johnny Herbert had more commitments in Japanese Formula 3000. In qualifying, Ayrton Senna took pole again, with title rival Nigel Mansell second, the Englishman complaining of traffic on his final two hot laps. Gerhard Berger was third, followed by Riccardo Patrese, Alain Prost, Jean Alesi, Schumacher, Nelson Piquet, in his 200th Grand Prix, Moreno, and Pierluigi Martini, in the Ferrari powered Minardi. ^ "Motor Racing Programme Covers: 1991". The Programme Covers Project. Retrieved 13 November 2017. ^ "1991 Italian Grand Prix". formula1.com. Archived from the original on 3 November 2014. Retrieved 23 December 2015. ^ a b "Italy 1991 - Championship • STATS F1". www.statsf1.com. Retrieved 18 March 2019. Henry, Alan (1991). AUTOCOURSE 1991-92. Hazleton Publishing. pp. 206–207. ISBN 0-905138-87-2.